What does it mean to you when people ask about God’s Will for their lives? This is something I have questioned myself…often. Even as a guy who’s been in the ministry for years, served in many capacities, and been around the world on multiple mission projects, I can still wonder if I am in God’s perfect will, doing the things I should be doing. How about you? I’m glad to be in such good company! The fact is that many of us, especially those who sincerely want to please God and serve Him can find ourselves in gridlock, stopped dead in our tracks because we are wrestling with this whole concept of knowing and doing God’s “perfect will” for our lives. Having approached the mid-life point of life and been faced with multiple decision opportunities over the course of my life, I want to share some of the things I have to remind myself about concerning God’s plan for my life….and for yours. Finding God’s Will Is Not About Discovering Life’s Details. Demanding details reveals my distrust in God’s power and love. God is not obligated to show me anything about my future. My prayer life can sometimes sound like I am playing 20 Questions or treating God like a magic genie begging for some wishes to come true. Instead, what I really believe God wants is for me to trust Him NOW and as I walk INTO the future. Asking God for His plan for my life becomes more about me having details than really knowing what He wants. God has outlined much of what He wants in scripture already. So when I come and want His plans for MY LIFE…that’s details. A “Perfect Will For My Life” Prayer May Be Egocentric. No one wants to fail, right? I want every decision to be right and I want to succeed in all I do. There’s nothing wrong with that except that pride may be in the way. I have to remember that God didn’t reveal everything to His people in the past, nor His prophets, disciples or even His Son. Asking God to give me insight on everything in my life, next steps, and decisions about the future is important wise. But it’s also essentially important to remember that God’s “perfect will” for my life is ultimately going to result in me becoming more and more like Him, which means less and less about me. Finding God’s Will Should Not Substitute Knowing God. Wanting my life to count and matter is one thing but sometimes I can become so caught up in myself mattering that I can completely forget what really matters; and that’s God! God may wait in answering, allow uncertainty, or even do something completely unexplained expecting me to trust in Him and His character. God’s Will is for me to know Him. God’s Will is for me to glorify Him regardless of what I know or don’t know. And God may even not tell me everything because when I feel like I “know-it-all” I have no need for Him. And no one likes a “know-it-all”, right? There’s only room for one of those and God’s His name. God’s Will Is More About Who I Become Than What I Do. Sure there are things God wants me to accomplish that I may not know yet. But many things God wants are already explained in scripture i.e. go and make disciples, love my enemies, forgive others. I should focus more on becoming the person God wants rather than trying to figure out where God wants me. Because if I am the person God wants me to be, I will bring change regardless of where I am. Knowing and Doing God’s Will Is A Matter Of Risk And Obedience. Because God does make some of His Will known to me, I have to be willing to follow through with what I don’t know and risk everything else on God’s ability and promises. It is often not an issue of not knowing what God wants me to do as it is a matter of me being to risk my everything on what He has said. It may very well be that God won’t reveal or give any further direction until I obey that last direction He gave me. 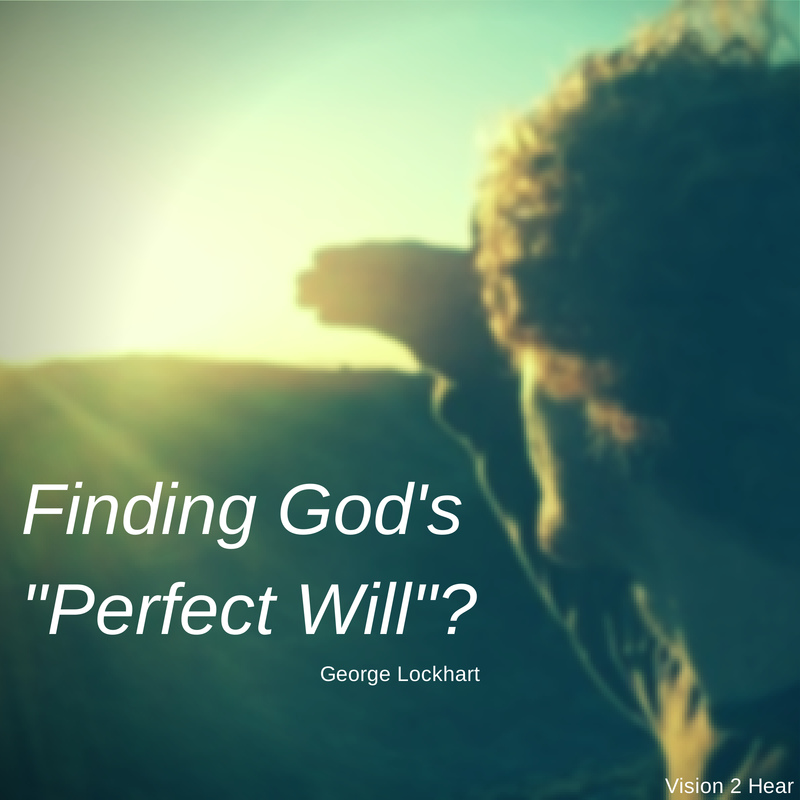 What to do about finding God’s “perfect will”? I’ll handle that in another blog post soon. Until then, comment on what you think about this blog. Let’s discuss what goes on in your heart and mind on finding God’s perfect will. Check this out and comment! Would love to hear from you.